What Is It About Winter That Calls You Back To The Water? Is it the Lack of crowds? Is it the masses headed to the Hills to ski or maybe you just need to get out because, well you like to fish? 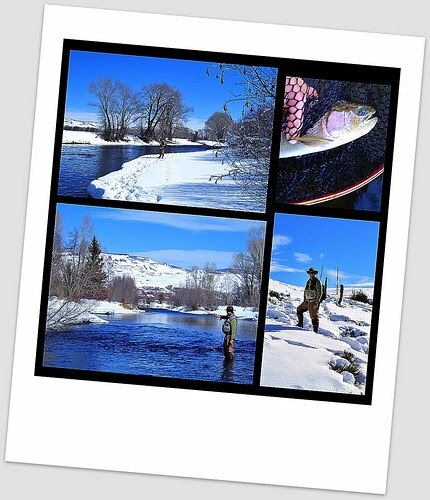 Winter Fly Fishing in the Rockies can be an experience all to itself if you need a day out on the water. Winter fly-fishing in Colorado is much different from Fall and Spring fishing, the people are gone, the scenery is awesome, and the pace is relaxing. Due the winter weather it can change minute to minute so be mindful of your area and always be prepared for that nasty storm at any time. Definitely first and foremost you need to keep toasty and stay dry while Winter Fishing. A way to keep your feet warm is to always wear boot foot waders. Avoid various types of stock foot waders and wading shoes because they restrict the blood flow to your feet making them cold. You can also use the chemical heat packs in between two socks to help keep your feet warm on very cold days or go sockless if you're a tough guy. There are a ton of tips out there to do, it really comes down to how cold you get as well. I don't get that cold so my techniques may be different than others. My favorite gloves to use are capilene liners with a couple of fingertips clipped off. Over the gloves I wear fingerless gloves. One thing also to look out for since Winter time fishing means Midge Fishing, so watch out for those tiny flies catching your gloves when swapping them out. It's almost a magnet for small flies to get snared on your gloves every 5 minutes so I just take mine off when changing flies. I always carry two or three pairs of different style gloves (for me and those who may forget) so that I can replace them if I get a hand wet holding a fish for a photo. I’m also a huge fan of cold weather wading pants of the micro fleece variety with anything that breathes and no sweat. NO JEANS ALOUD!!! This set up allows me to fish in various temps well below freezing in comfort and safety. Jackets, hood and socks can also vary so do your homework and don't forget to be comfortable, nothing worse than being stiff and uneasy all day in the cold. Most Trout become sluggish in cold water and slightly lethargic so you definitely have to not only find them but put it on their nose. Fish tend to hold in the lower layers of the water, sometimes coming into the shallowest areas when the sun warms a specific area. Deep nymph fishing is the most preferred fishing method for most in the winter time. Some use a sinking tip line that will quickly take the fly but I still change up and a majority of the time use floating line. If you are not using a sinking line, try adding some split shot weights to your fly if needed, just watch your casting. If you chunk streamers, any big streamer or heavy fly, slow down your casting motion and you'll eliminate a lot of knots before they happen. Nothing is also worse than trying to keep changing your flies when freezing fingers are present so keep it simple and be confident in a few flies and leave it. For a complete listing of top winter flies to use, Pat Dorsey is the man to listen to on what to use, I've used so many of his flies during the Winter that anyone of a number of them will work perfectly. 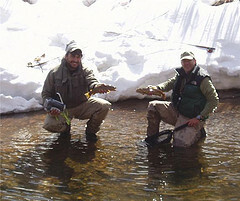 Winter trout are unlikely to rise to take a single fly normally. Trout save their energy for either a big hatch or perhaps a tempting morsel. Streamers can be effectively fished using a slow retrieve or through various stripping techniques. On rivers like the San Juan this is a prime time to be out fishing, or other places can be a dead day so make sure to also do some homework on what is fishing well and what turns on better for Spring fishing. Use vaseline, dip rod into the water, use your forceps and pock/prod, use cooking spray, WD40 spray? Too many to choose from I'll let you decide what works best. If you are "dipping" you rod to thaw the guides be very careful. While fishing the water tends to run down the line on to the reel. The result can be a frozen reel that can lead to a variety of problems; some of which can be hilarious and others not so funny - sprung reels and when a fish attempts to run smash leaders and in one case a snapped rod tip. There are a ton of ideas on what guys use so feel free to let us know what you think also, opinions always vary. As a final note, I always take a few rods, nothing worse than one rod hanging up and either not casting well, the line gets hardened or you need to change up quickly without freezing changing your gear out on the same rod. There are guys I know that fish much more in the Winter season than I do (it's my busy seasonat work) so this is just a little information I can up with, I'm sure there's much more out there on tactics and things that work better. Get out enjoy some fishing and stay warm!